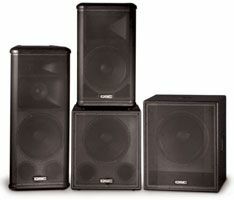 QSC Audio Products, Inc. is expanding its loudspeaker line with the new HPR Series. The self-powered HPR Series has been designed to deliver the unrivaled sonic performance of QSC's loudspeakers, complemented by the legendary power and reliability of QSC amplification. With the HPR Series, QSC has designed a powered loudspeaker system with the same top-quality discrete components and rigorous standards used in QSC's rack-mounted amplifiers, and perfectly matched it to its speaker componentry. With the success of its acclaimed ISIS WideLine, AcousticDesign and ModularDesign lines, the company has also firmly established itself as an innovative leader in loudspeaker design. Boasting heavy-duty 13-ply birch enclosures, tour-grade 16-gauge steel grilles, ergonomic handles and even heavy-duty three-inch castors on the HPR181W, the HPR line is designed to travel. All HPR models feature QSC's unrivalled performance and power, and are backed by the company's legendary customer service and support. The HPR152F is a versatile two-way, bi-amplified 15-inch system delivering 500 watts of continuous power with an extended frequency range of 48 Hz-20,000 Hz and a generous coverage pattern of 90 degrees x 60 degrees. The HPR153F is a three-way, horn-loaded design featuring a 15-inch low frequency driver, a six-inch midrange and 1.4-inch compression driver. With a smooth dispersion pattern of 90 degrees x 40 degrees and 600 watts of continuous power, the HPR153F boasts an extended frequency range of 37 Hz-20,000 Hz. Both units are ideal for nearly any sound reinforcement setting.